Do English People want Scotland to Stay Part of the UK? I thought it was strange the second question had not been asked more often, so thought I would run a poll myself. As you can see – very, very close. So close in fact that – if you look at those ‘+/-4.6%’ error bars, it’s literally too close to call based on the 1,000 people surveyed. 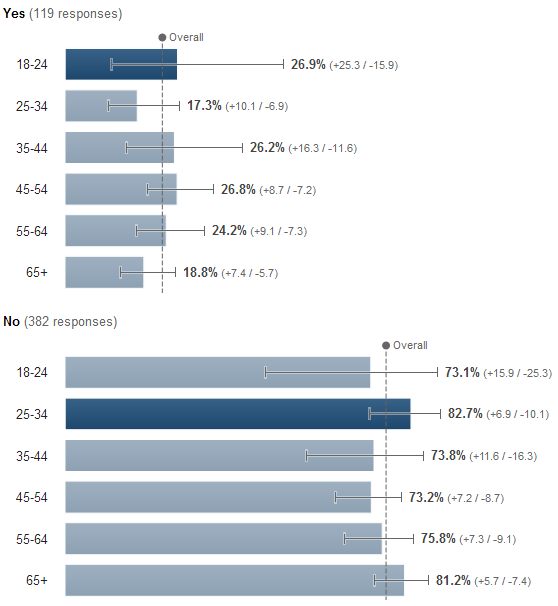 Here are the results split by age, for the 2/3 of respondents where the age was known. 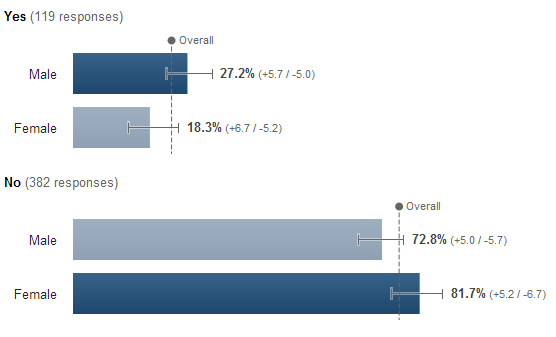 Again, that’s leaning toward ‘Yes’ for male, and ‘No’ for female, but too close to call. I ran exactly the same survey across 500 people in England – asking the question “Should Scotland be an independent country?” (worded exactly, I believe, as the official ballot question). 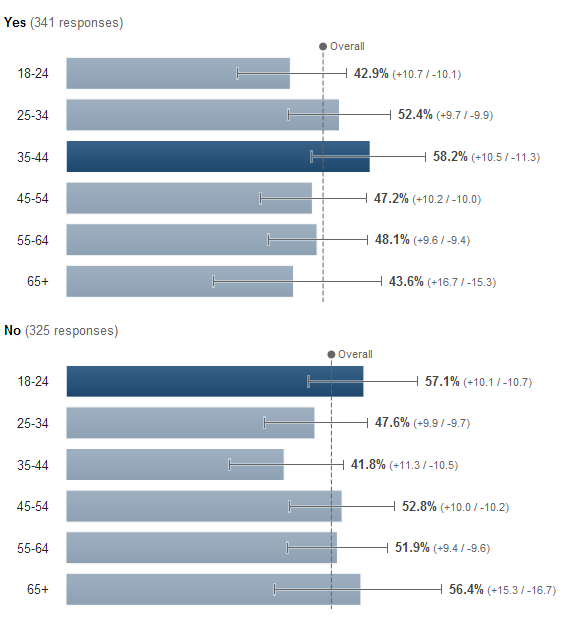 Splitting this out by age, the results are very similar across all brackets (albeit note the error bars again here – these are very small samples in each group, so far from exact). Again, splitting by gender we see a similar picture: English people do not want Scotland to be an independent country. 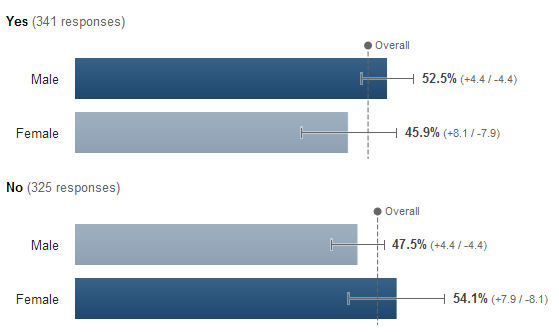 It’s always worth caveating this kind of survey (in fact that’s true of almost all data). This is not an election. I did not ask “If you were to vote today, how would you vote when asked the question ‘Should Scotland be an independent country? '” – I simply asked the actual ballot question Scottish voters will be asked. You’ll notice that I surveyed 500 people in England here, and 1000 in Scotland (note ‘in England’, ‘in Scotland’ rather than English/Scottish). The reason for that was I started by surveying 500 people in each. The “England” results were so conclusive I stopped. There was no clear winner in Scotland, so I ran for another 500 responses. Again, too close to call. The final obvious caveat is: I haven’t surveyed Northern Ireland or Wales here. If you’d like me to do that, feel free to add a comment on the post. And – if you’d like me to survey more people in England if you feel doing so would alter the outcome – feel free to drop me a note too. The English audience on the other hand are are very, very, very much swayed one way: they want Scotland to remain part of the UK. Do share this with others if you think they may be interested.